With only 15 minutes left until the charter bus took off and drove the entire crew back to campus, Luke Schwettman kicked himself into overdrive and did a couple more snowboard runs. He first found a mountain bike trail to ride on where he hit some jumps and as he got nearer to the bottom, he found himself in the terrain park under the one of the lifts where he hit all of the jumps, leaps and gaps for the first time. That was how Schwettman wrapped up a long day at Stevens Pass. 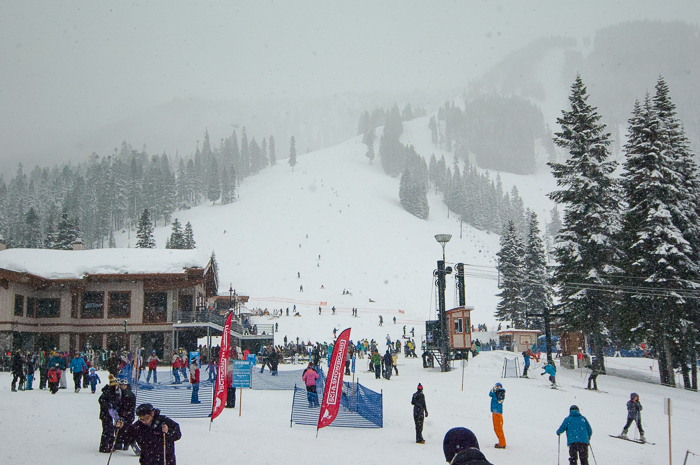 The ski trip was held by SCC Intramural Club and brought 40 SCC students to Stevens Pass on Sat, Feb. 13. Alan Zhang, an international student from China said he walked away from the ski trip with a more heartfelt passion for skiing. Zhang started skiing in Switzerland last year, and transportation had always been a problem for him in the U.S. since he’s not a car owner. He said it was really helpful to just be on campus and get the transportation he needed. Ahmad Alsaif, another student and an assistant in the International office said that he not only appreciates the pricing and transportation, but also the socializing opportunity that came from several hours of skiing and sitting on the bus with other students. Even though it wasn’t his first time seeing snow, he still appreciates every snow experience since he came from Saudi Arabia, a country where it never snows. Stacie Attridge, the Intramural Coordinator thought the biggest appeal of this trip was the experience that students could get out of it. Attridge also said the Ski trip was beginner-friendly (most of the participants were beginners) and they all had a fair chance of going up the mountain. Snowboarding and skiing lessons from staff at Stevens Pass were also available. The Ski Trip was subsidized by the Intramural program, which is funded by the SS&A fee. According to Attridge, the intramural club had been hosting ski trip to Stevens Pass for about 15 years and she believed that next year would be no exception. Remember when you were young and looked out the window to see this tiny white icy stuff all over your yard? Remember the excitement you felt when you yelled “it’s snowing” to your parents all while running around with your little kiddie feet? Well I do, cause it happened to me last week on the ski trip. Hong Kong, where I am from, is a place where it only snows in a snowglobe. It was something I had only heard about – my parents told me it was a scam thought up by travel agents. Snowball fights only existed in video games and snowboarding only happened in really awful math problems. Despite being too financially challenged to ski or snowboard, I still had an awesome time at Stevens Pass. Being able to put my hands out and see the snow fell on my glove, or throwing mega-sized snowballs at my friends… I’ve never had moments like these, and the experience was priceless.